Strictly Sail 2012: Kick Off the 2012 Sailing Season in Grand Fashion. Join Karma Yacht Sales as your Lake Michigan Beneteau Dealer at the 2012 Progressive Insurance Strictly Sail Chicago Sailboat Show- Chicago's Navy Pier January 26-29. If you have ever wanted to learn to sail, you own a boat, would like to own a boat or sail on someone else's boat- Strictly Sail represents a great opportunity to learn about sailing, continue your sailing education, buy your next boat or buy gear! As your full service Lake Michigan Beneteau Dealer, Karma Yacht Sales will be the host dealer for Benteau at the show where we will be displaying the latest models from Beneteau. Visit us at Display #220 where we will have the First 30, Beneteau Oceanis 37 and the Chicago debut of the NEW 41 and 45! Stay Tuned for more details on Speakers. Chicago, IL, November 15, 2011: The Chicago Yacht Club recently announced that Lou Sandoval was appointed to chair the 104th and 105th Chicago Yacht Club Race to Mackinac presented by Veuve Clicquot. 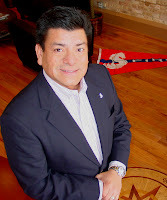 Mr. Sandoval, a seven year member of the Race to Mackinac committee was formally introduced as incoming chairman at the recent Race to Mackinac Awards Ceremony on November 5th. Mr. Sandoval has completed twelve races to Mackinac in which his boat ‘Karma’ has successfully campaigned and won it’s section six out of the past eight years. He has been an active member of the Lake Michigan Sailing Community. In May, 2011 he was recognized as US Sailing’s Sailor of the week for the work he has done serving on the board of the Judd Goldmann Adaptive Sailing Foundation and the Boy Scouts of America-Chicago Area Council where he serves as Council Commissioner. An active volunteer, Mr. Sandoval believes in serving as an ambassador of the sport of sailing to share the sport with diverse communities who perhaps have not had the chance to grow up in the sport. Mr. Sandoval will also be stepping into a larger leadership role at Chicago Yacht Club as a member of their Board of Directors commencing with the 2012 year. Karma Yacht Sales is proud to support Mr. Lou Sandoval’s appointment and his committed leadership in the sport of sailing. About Chicago Yacht Club: The Chicago Yacht Club is one of the oldest and most respected yacht clubs in the world. Today, the club boasts a membership of nearly 1500 boating enthusiasts and is one of the preeminent organizers of regattas, races and predicted-log events in the United States. The club offers an array of spectacular off-the-water amenities, including fine dining and full-service catering at both its Monroe and Belmont stations. “A tradition of yachting excellence” is a fitting description of a club that has dedicated itself to promoting the sport and perpetuating the values of camaraderie and community since 1875. About the Chicago Yacht Club Race to Mackinac: At 333 miles (289.4 nautical miles), the Race to Mackinac is the oldest annual freshwater distance race in the world. ‘The Mac’ starts at the Chicago Lighthouse, just off Navy Pier and continues to Mackinac Island. 2011 marked the 103rd Running of the Race to Mackinac, in which 355 boats competed in the fourth consecutive sellout of the Race. The 103rd marked the third largest fleet in the history of the race with almost 3500 sailors participating. The Race has also amassed a strong following using technology and social networking; it can be followed virtually using Facebook, Twitter and its Race tracking interface. The 103rd race and yacht club site was visited by over 300,000 website visitors. Our Facebook page has been visited by well over 2 million visitors to date.